Rajiv Shah, who headed the .government’s foreign aid operations, has been appointed the head of the Rockefeller Foundation, a multi-billion dollar private global charity with programmes in India. The New York-based Foundation said Jan. 5 that its trustees had selected Shah, who is a medical doctor and was the administrator of USAID, to be its next president. He will take over the job from Judith Rodin in March. 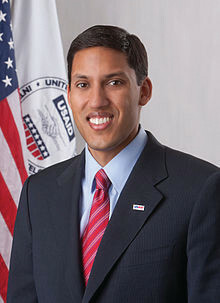 Announcing the appointment, the Foundation said that Rajiv Shah “is best known for elevating international development in foreign policy, delivering results through public-private partnerships and the respect he earned working with counterpart governments from Afghanistan to Central America and with bipartisan leaders in the U.S. Congress”. Born in the U.S. and educated in the U.S. and Britain, Shah, as a medical student, had volunteered in a poor community in India. He has a medical degree and a masters in health economics from the Ivy League University of Pennsylvania.